Netflix NFLX stock dropped Friday in continuation of Thursday’s after-hours downturn sparked by the firm’s Q4 revenue miss. The streaming TV giant did post solid subscriber metrics and Netflix remains confident that its content spending will pay off in the long run. So, let’s take a look at what we learned from CEO Reed Hastings and other executives on Netflix’s Q4 earnings call to help evaluate Netflix as the likes of Disney DIS, Apple AAPL, and others enter the streaming market. Netflix’s fourth-quarter revenues fell just short of our Zacks Consensus Estimate. The company did top our adjusted earnings estimate, which still marked a huge year over year drop off as it continues to spend billions on content. But investors seemed to discount the fact that Netflix added 8.84 million new paying members in the quarter to blow past its own quarterly estimate (also read: Everything You Need to Know About Netflix's Q4 Earnings Results). The company’s growing debt load has worried some investors. 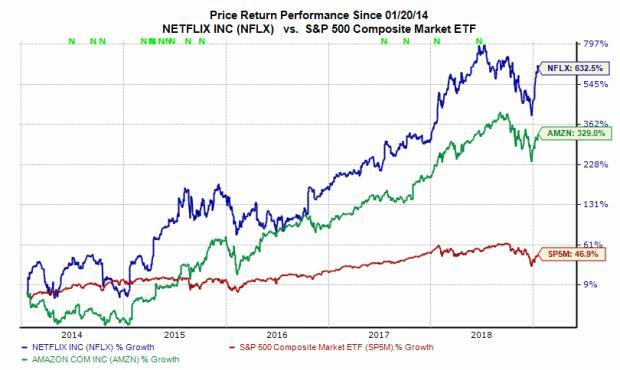 But going forward, Netflix understands that spending on content and growing its original programming library is really the only business model that matters as the likes of Disney enter the market and big-pocketed rivals such as Amazon AMZN continue to spend on streaming. Netflix reported a negative cash flow of $1.3 billion in Q4 to bring its full-year total to negative $3 billion. Netflix expects to report a similar level of negative cash flows in 2019 and then “meaningfully improve that trajectory going forward.” Netflix now expects its margins to climb from 10% last year to 13% in 2019 and beyond. The company said that Netflix originals account for a “vast majority” of the content watched on its platform. But the firm still plans to buy second-run shows like Friends. Last year, Netflix also had 140 different shows that premiered on a network in a specific country or region and then premiered on Netflix everywhere else on the world. Looking forward, Netflix expects that number to hit 180 in 2019. These shows are often co-produced by the streaming firm, where Netflix comes in at the script and first-money stage and is directly involved in the creative and production process. Netflix used its successful and recent Golden Globe-winning Bodyguard, which premiered on BBC in the U.K. and simultaneously was released on Netflix around the world, as an example. Netflix has really only offered original content for six years. Today, the company offers everything from bigger-budget movies and TV shows with A-list Hollywood stars to unscripted programming, which the firm said has performed well. Hastings boasted that Netflix owns about 10% of the total U.S. TV entertainment market, which it estimates sits at roughly 1 billion hours a day. Netflix noted that this massive number includes everything from gaming to linear TV. In fact, despite streaming platforms due out from Disney, Apple, and AT&T T, Netflix is just as concerned about trying to win away time from Xbox MSFT and YouTube GOOGL. “We compete so broadly with all of these different providers that any one provider entering, only makes a difference on the margin,” Netflix’s CEO said. Netflix raised its prices earlier in the week for the first time since October of 2017, and the new price hikes represent the largest increase since it launched streaming 12 years ago. This should help it spend more money on content because going forward, the firm’s success or failure, will be determined by its ability to offer buzz-worth and award-winning shows and movies. NFLX stock rested down 1.7% at roughly $347.29 a share through morning trading Friday, which marked a roughly 18% downturn from its 52-week high.